Yes, you read that right on the home page…we are in Bozeman, MT right now…and not the East coast. For some time now, we’ve been trying to decide whether or not we wanted to continue traveling full-time or settle down for a bit. Settling down won. And like so many of you know, we left our hearts in Bozeman…so what better place to go back to? I know, I know…it’s a little cooler up here than Texas, but we like it. We arrived on Friday afternoon and pulled into our new site, which is on private land about 7 miles from Bozeman. One of the local campgrounds that was closing for the season recommended we contact the owner, who had a few spots open for the winter. It’s the perfect set up for us…and there are mountain views on all sides. In fact, as I type this, I’m watching the sun glisten off of the Spanish Peaks. We’re on the same road that runs into Yellowstone…just 90 miles north! But what about the TOUR!? Well, after a year and a half of full time nomadic living, we’re ready to have a mailbox again. We’re not going to say we won’t travel anymore…because that’s been deeply rooted in our hearts after this experience. We’re just taking a rest to re-connect, get involved with our church, and spend time with friends who we don’t have to drive away from every couple of days. Matt’s sister Mindy and her husband, Ryan, also live here, as you may recall…and she is due with their first baby in January. We’re excited to be here for that! Some of our best friends are here too…James, Deea, Cassia, Minda, and Tofer…yes, I’m talkin’ bout YOU! 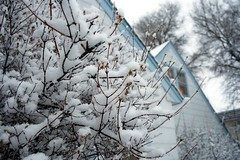 Check out some of Deea’s gorgeous photos of Bozeman here. *To shop at the best coop around…isn’t it great? And of course, we’re looking forward to the SNOW!! Matt is already looking for little skis and a snowboard for Bella. He’s been wanting to teach her from the moment she was born. Matt LOVES to snowboard and has really been missing it since we left, so he’ll be on the slopes whenever he has the chance. I will be back to blogging a bit more as well…catching up with where this blog left off out in California! I have so many fun photos and stories I want to share…life has just been a whirlwind! There are a few new pics up in my Flickr sets of our time in Iowa this summer. Mostly of Bella and her best friend, Bianca. And if you haven’t seen the photographer’s pics from my sister’s wedding…check those out here! She was a beautiful bride. That’s all for now…more to come soon!